Amazon just listed a special on 76mm Zombie Hawg wheels in duros of 78a, 80a, 82a, and 86a (no 84a). A set of 4 is $29.95. You need two sets for quad skates, for a cost of $59.90. They combine the shipping of two sets for $7.99. This is a good deal on prolly the best outdoor skate wheel on the market today. Remember these are longboard wheels and need to be cut down from a width of 44mm to, say 31mm to reduce weight and the wideness of your skate. You can cut them down in your garage or find a skate shop to do it. There are also a few folks in this Forum that cut down wheels. My preference is the 86a duro. It's the longest-wearing and fastest of the bunch. So they're 44mm wide even though it says "31mm contact patch" on the wheel itself? They have very large 5-6mm radius rounded corners on the inside & outside edges of the wheels. It is worth it to remove most (4-5mm) of these dead weight, no contact zones from both sides of wheels for weight reduction, and then round off the newly formed, sharper corner somewhat further to minimize potential for corner chunking damage from the more frequent outdoor impacts with sharp edged imperfections of the rolling surface. These wheels handle such impacts brilliantly, as long as their edged aren't too sharp cornered after narrowing them. My 2nd set of 76mm Z-Hawg wheels in 86A (1st set was 84A) are now approaching 1000 outdoor miles of use and there is an average of only a bit more than over 1mm diameter reduction (.5mm surface lost) from wear. This is phenomenally good wheel durability and wear resistance on concrete and asphalt. 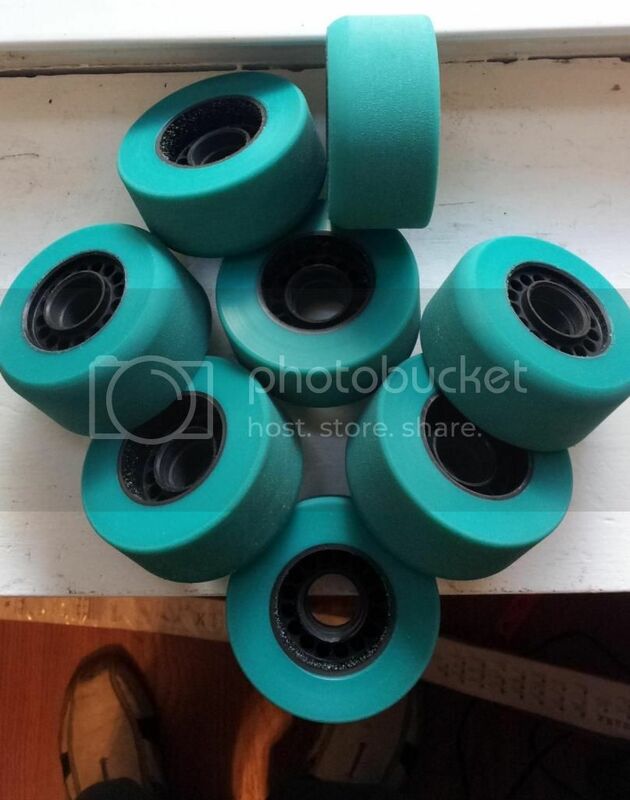 PIC below shows outsides of the original 84A wheel (in turquoise; now different color) faced to remove large radius and then sharp corner sanded into smaller radius. Original large radius remains on opposite side. Last edited by Armadillo; November 22nd, 2016 at 04:59 PM. I think the hub is around 32mm wide. It is side-set to the inside wheel face. That leaves about 12mm of the outside of wheel unsupported by the hub. This is the part to remove. How much to remove is up to you. I cut mine down to 30mm, but that cut into the hub. That’s not a problem, it just looks ugly. If you narrow them to a meaty 35mm the hub will be untouched.